My approach to transmogging is decidedly free-form: I typically dislike Blizzard’s ready-made sets and prefer to make my own, usually completely from scratch. The approach has both advantages and disadvantages. On one hand, my mix-and-match style is limited by the design changes Blizzard has implemented over the 13 years (gosh!) of World of Warcraft. They show both in the quality of the graphics and in the style and color of the gear designs. On the other, I don’t need to hunt down every single piece in a pre-made set in order to build a transmog. So far, the approach has worked pretty well for me; I like both the challenge and the freedom. Every now and then, however, I run into a conundrum. Transmogging my mistweaver monk is problematic because I don’t have a clear idea of what I’d like to do with her. Well, except for one thing: I tend not to like the look of the Legion artifacts (see Erik’s quick primer here), so I pretty much always mog them. I’ve tried several different looks for her, only to grow unhappy with them. The only constant between them has been color—the sets have been based on yellow or golden brown tones to go with my toon’s blonde hair. The most recent iteration is also color-driven, but this time I tweaked the golden browns into a clearly browner direction and added turquoise details. Often when I don’t have a clear idea or a concept for a transmog, I browse through my wardrobe looking for interesting pieces of armor and try building a set around them. That was also the case with this current brown-turquoise set. I first noticed the distinctive-looking shoulder armor. Once I found a belt and gloves that matched the shades almost perfectly, I knew I had a working solution. 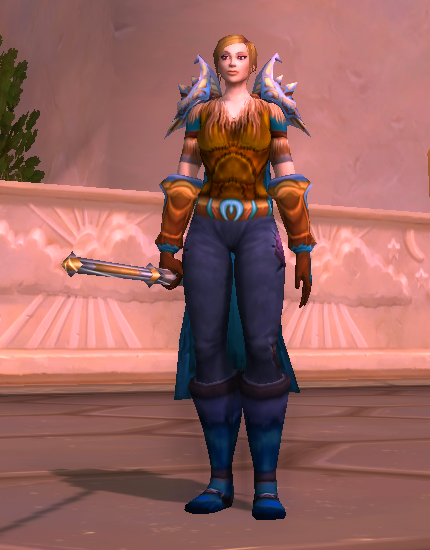 I deliberately picked more non-descript pants and boots, plus a simple staff for the artifact, to draw attention to the colorful armor pieces. The final touch came from the combination of a chest armor that leaves my monk’s upper arms bare with a turquoise short-sleeved shirt underneath it, so that the shirt covers the bare arms and provides an additional pop of color.